When Mary Mouse gives birth to her thirteenth baby, she notices that he is much smaller than his siblings. The new mother decides that "he should have an important-sounding name to make up for his lack of size. On second thought, he should have two important-sounding names. But what should they be?" Mary receives her answer when she comes across a scrap of the paper that she had torn up to line her babies' nest. Originally from some sheet music left on the piano stool near the family's mouse hole, it contains the words "WOLFGANG AMADEUS MO." So the tiny baby, only half as big as his brothers and sisters, becomes Wolfgang Amadeus Mouse. As the youngsters grow and explore the world outside of their home, they delight in racing up and down the keys of the piano. Poor Wolfgang Amadeus can never keep up, and has to endure the teasing of his larger and stronger siblings. Even his name is a source of ribbing: " 'There's only one thing long about him...and that's his name. I can't get my tongue around it. It's too much of a mouseful.' 'Well, okay. Let's shorten it.' 'What shall we call him, then?' 'Just Wolf.' 'Wolf?' cried the other voices. 'What a joke! Tee-hee-hee! A mouse called Wolf!' And they all giggled at their little brother, not caring, as usual, whether his feelings were hurt." Gradually, to Wolf's delight, his brothers and sisters leave home, and before long, only Mary and her youngest share their mouse hole. It is then that Wolf discovers a unique talent. While he and Mary are hiding from the cat belonging to Mrs. Honeybee, the human resident of the house, the little mouse sings a song to cheer his mother. He is unaware that the old lady is listening, recognizes the melody as one she often plays on the piano--and is enthralled by the sweetness of Wolf's voice. Mrs. Honeybee tests his talent by playing different songs, and is pleased when Mouse learns them all (even though she cannot understand the words he sings). Eventually, she begins leaving chocolate for the mice, then enticing Wolf to take the treat while she is present, and finally offering it as a reward for singing--much to Mary's horror. However, the youngster convinces his mother that this human is not like others, and she means them no harm. Life is good for Mrs. Honeybee, Mary, and Wolf. Even the cat, after an earlier incident, has become terrified of the mice, and even hearing a squeak is enough to send the fearful feline fleeing from the room. But one morning, Mrs. Honeybee falls and injures her ankle. Unable to get up to call for help, she sees Wolf, but knows that even such a talented mouse cannot call 911. But Wolf, seeing that something is wrong, understands that other humans are needed, and that they are outside--so he uses his special gift to bring assistance to his dear friend. Recommended by Barbara Karp, Librarian. 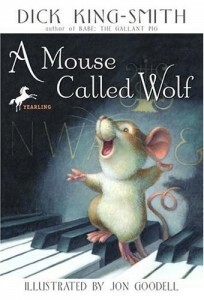 a mouse called wolf is a fantasy book he lives in a girls house named mrs.honeybee pianist. wolf loves her music wolf got his name from wolfgang amadeus mozart.